Biochemist Mark Driscoll is trying to crack open a stubborn microbe in his lab at UConn’s technology commercialization incubator in Farmington, Connecticut. He needs to get past the microorganism’s tough outer shell to grab a sample of its DNA. Once he has the sample, Driscoll can capture the bacterium’s genetic ‘fingerprint,’ an important piece of evidence for doctors treating bacterial infections and scientists studying bacteria in the human microbiome. It’s a critical element in the new lab technology Driscoll and his business partner, Thomas Jarvie, are developing. But at the moment, his microbe isn’t cooperating. Driscoll tries breaking into it chemically. He boils it. He pokes and pushes against the outer wall. Nothing happens. This drug-resistant pathogen is a particularly bad character that has evolved and strengthened its shell over generations. It isn’t giving up its secrets easily. 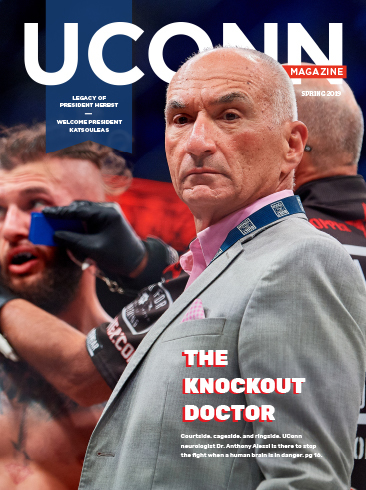 Stymied, Driscoll picks up the phone and calls Professor Peter Setlow at UConn Health. A noted expert in molecular biology and biophysics, Setlow has been cracking open microbes since 1968. That brief encounter, that collaboration between a talented young scientist and a prominent UConn researcher working in Connecticut’s bioscience corridor, not only results in an important breakthrough for Driscoll’s and Jarvie’s new business — called Shoreline Biome — but also leads to a proposal for more research, a new finding, and at least one patent application. In a broader sense, it also exemplifies the collaborative relationships that UConn and state officials hope will flourish under the University’s Technology Incubation Program or TIP, which provides laboratory space, business mentoring, scientific support, and other services to entrepreneurs in Connecticut’s growing bioscience sector. At incubators in Storrs and Farmington, TIP currently supports 35 companies that specialize in things like health care software, small molecule therapies, vaccine development, diagnostics, bio-agriculture, and water purification. The program has assisted more than 85 startup companies since it was established in 2003. Those companies have had a significant impact on Connecticut’s economy, raising more than $50 million in grant funding, $80 million in debt and pay equity, and more than $45 million in revenue. Driscoll and Jarvie, a physical chemist and genomics expert, arrived at UConn’s Farmington incubator in June 2015 with a bold business concept but virtually no idea of how to get it off the ground. Both had worked in the labs at 454 Life Sciences in Branford, Connecticut, one of the state’s early bioscience success stories that ended up moving to the San Francisco area. Driscoll and Jarvie decided to stay in Connecticut. They had talked about starting a business based on new technology that would more quickly and precisely identify different strains of bacteria in the human microbiome, the trillions of good and bad microorganisms living in our bodies that scientists believe play an important role in our health and well-being. The study of the microbiome is a rapidly growing area of biomedical research. There are currently more than 300 clinical trials of microbiome-based treatments in progress, according to the National Institutes of Health, and the global market for microbiome products is estimated to exceed $600 million a year by 2023. Fortunately, Driscoll and Jarvie’s decision to launch a bioscience company came at a time when Connecticut and UConn were committing resources to strengthen the state’s bioscience research sector. As part of Gov. Dannel P. Malloy’s Bioscience Connecticut initiative approved in 2011, Connecticut’s legislature allocated $864 million to efforts that would position the state as a leader in bioscience research and innovation. That initiative included the expansion of UConn’s technology incubator site in Farmington, the opening of The Jackson Laboratory for Genomic Medicine (JAX), and major upgrades at UConn Health to boost its research capacity. Those resources were tailor made for a fledgling bioscience company like Shoreline Biome. 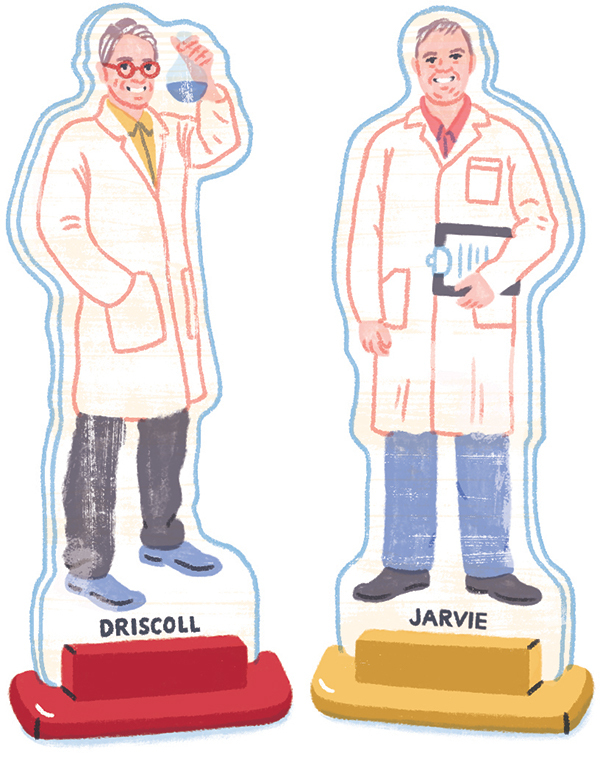 Driscoll and Jarvie remember the early days when company ‘meetings’ took place at a local Starbucks, their official address and warehouse was Driscoll’s garage, and they didn’t even have a lab. But they did have a vision of what Shoreline Biome could be. They knew that George Weinstock, one of the world’s foremost experts in microbial genomics and one of their customers at 454 Life Sciences, had just arrived at Jax. They reached out to him with an offer to collaborate. Weinstock not only agreed, he became their principal scientific advisor. The pair also obtained $150,000 in pre-seed funding from Connecticut Innovations, the state’s quasi-public investment authority supporting innovative, growing companies; and a $500,000 equity investment from the Connecticut Bioscience Innovation Fund (CBIF). Along with the pre-seed investment funds, CBIF’s staff helped guide Driscoll and Jarvie through the early stages of business development and introduced them to the investment community. AndCBIF member Patrick O’Neill took a seat on Shoreline Biome’s board. O’Neill’s business savvy has been crucial to the company’s early success, says Driscoll. The lab kit Driscoll and Jarvie are currently testing is a low-cost, off-the-shelf tool that replaces hours of painstaking hands-on processing of patient samples for bacteria DNA testing. It’s about getting DNA out of the bacteria from a complicated environmental sample and doing that in a fast, cheap, and comprehensive way, explains Jarvie. Researchers and medical professionals have previously relied on targeted testing and laboratory cultures to identify different bacteria strains. But many bacteria species are hard to grow in the lab, making identification and confirmation difficult. Even when scientists can confirm the presence of a bacteria such as salmonella in a patient sample, the findings are often limited, which can impact diagnosis and treatment. That level of specificity is important to researchers and medical professionals studying or tracking a bacteria strain or disease. Driscoll says the kit is not limited to identifying harmful bacteria like salmonella, listeria, or MRSA. It also can assist researchers investigating the microbiome’s role in maintaining the so-called ‘good’ bacteria that keeps us healthy as well as its role in other ailments such as diabetes, multiple sclerosis, and even mental health disorders like schizophrenia. For example, the kit easily lets a researcher compare 50 bacteria samples from individuals with multiple sclerosis and 50 samples from individuals who don’t have the disease to see whether the presence or absence of a particular bacteria in the microbiome plays a role in impacting the body’s nervous system. As part of their product testing, Shoreline Biome is working with researchers at UConn Health and JAX to learn more about a particularly toxic and potentially fatal intestinal bacterium, Clostridium difficile, otherwise known as C.diff. “People who track this disease, especially in hospitals where it is a problem, want to know how it gets in there,” says Driscoll. “Does it come from visitors? Does it come from doctors? You have all these spores floating around. You can answer that by looking at the bacteria’s genetics. But if you can’t get to the bacteria’s DNA, you can’t identify it. While their focus is certainly on growing Shoreline Biome, Driscoll and Jarvie also have come to appreciate Connecticut’s broader effort in building a strong bioscience research core to help drive the state’s economy. 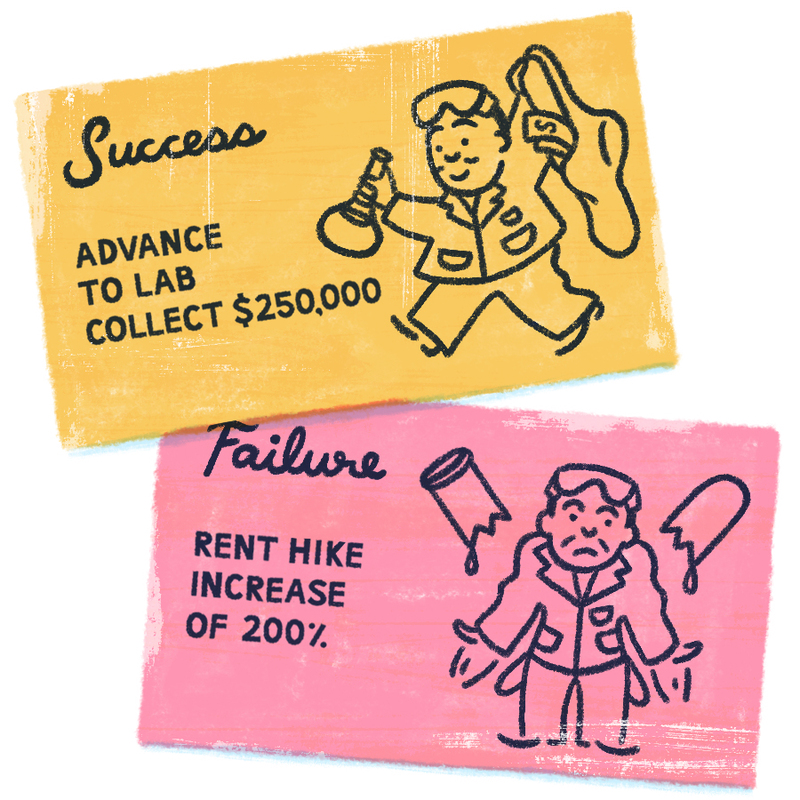 Providing scientist entrepreneurs with an affordable base of operations, working labs, access to high-end lab equipment, and a cadre of science peers ready to help, takes some of the pressure off when launching a new company. Mostafa Analoui, UConn’s executive director of venture development, including TIP, says the fact that two top scientists like Driscoll and Jarvie decided to stay in Connecticut speaks to the state’s highly skilled talent pool and growing innovation ecosystem. 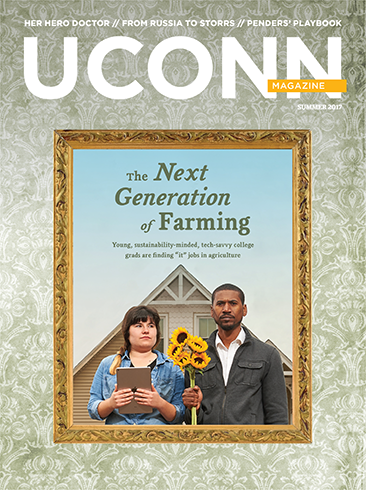 “Instead of going to Boston or New York, they chose to stay in Connecticut, taking advantage of UConn’s TIP and other innovation programs provided by the state to grow their company, create jobs, and benefit society with their cutting-edge advances in microbiome research,” says Analoui. UConn provides critical support to ventures at all stages of development, but it is especially important for startups, says Jeff Seemann, vice president for research at UConn and UConn Health. When asked if they still have those moments of abject fear that they aren’t going to make it, Driscoll and Jarvie laugh. “It never goes away,” agrees Jarvie. But during a recent visit to the Shoreline Biome lab, both men are in good spirits. The company met the 12-month goals set in their CBIF funding agreement in just six months. For that effort, Driscoll and Jarvie received another $250,000 check, the second of their two CBIF payments. In the world of business startups, however, there is little time for extended celebration. The two scientists mark the milestone with smiles and a fist bump, then turn around and get back to work.